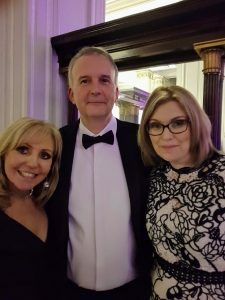 The 191st Annual Liverpool Law Society Dinner was held on 1 November 2018 at Cunard House in Cunard building. The President, Nina Ferris welcomed members and their guests, hosted presidents and chair people of professional associations. Dave Woods, Tracy Morgan and Eileen Chisnell were pleased to attend on behalf of Levins Solicitors. The Dinner held annually, provides an opportunity to celebrate the contribution to the city region of the legal profession. The event also showcases and raises funds for the President’s chosen local charities. This year the President’s charities for the event were the Clatterbridge Cancer Centre and KIND. It was a pleasure for representatives of Levins to attend the dinner, which is the highlight of Liverpool Law Society’s social calendar.